The 18-hole Sacconay course, just inside France, is less than 9 miles southeast of Geneva. The course is resplendent with brilliant views of the surrounding landscape. The many water hazards and hilly terrain present by no means the main challenges facing the golfer. It’s the expansive but hilly greens that really call for skill: hasty putters beware! Losing points is all too easy as you play through the crucial 3-putts. If you are looking for just such a challenge, then treat yourself and visit the Esery Golf Club. Driving range, practise bunker, approach-area, putting green, 9-hole-practise-course. 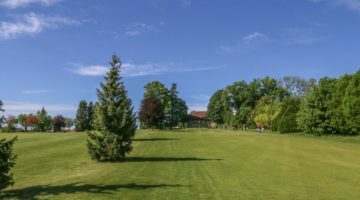 Members of ASG Clubs, members of international recognized clubs/associations, ASGI, Golfcard Migros- Members with Handicap 30.0 or less are welcome from Monday to Friday. On weekends members and member’s guests only.